Bring the effortless elegance of an 18th century French Country chateau to your very own home with this handsome, vintage dresser. The solid wood frame features delicately carved details and beadwork with hand-painted burlap drawer fronts and ornate ring pulls. 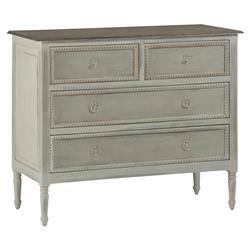 Finished in antique white, the chest makes the perfect addition to any room in the home from bedroom to foyer.